For many of us, the day doesn't really start until we get that cuppa joe from our favorite coffee shop. If your barista knows you by name, you know what I'm talking about. When it comes to fueling the masses with liquid energy, some cities go above and beyond. 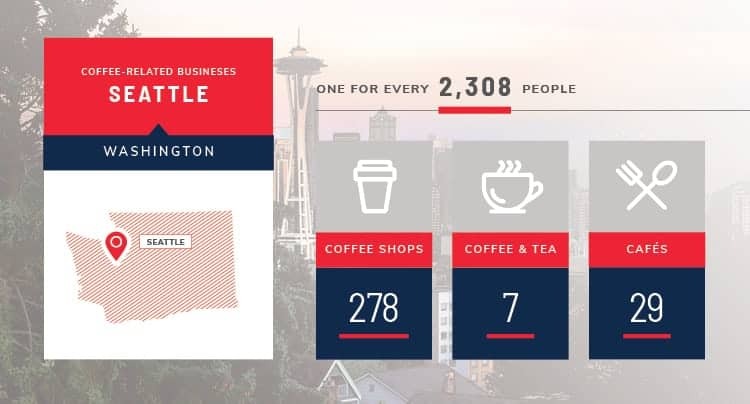 It's no surprise that the Pacific Northwest is well represented on our list of the best cities in America for coffee lovers. These 10 highly caffeinated locales have the most coffee shops per resident, so that quick fix is never too difficult to find. 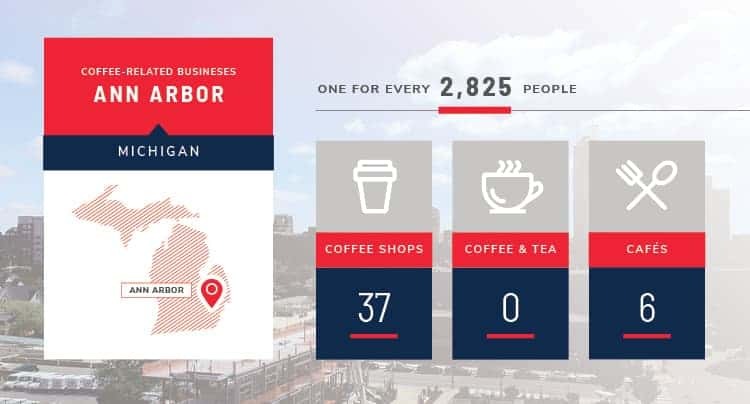 With a total enrollment of more than 44,000 students, plus one professor for every 12 students, the University of Michigan is a likely inspiration for the many coffee shops scattered across Ann Arbor. Coeds have plenty of places to get that all-important caffeine infusion to help them cram for exams. Even with the significant Latter Day Saints population abstaining from coffee and tea, Salt Lake City has some serious coffee cred. 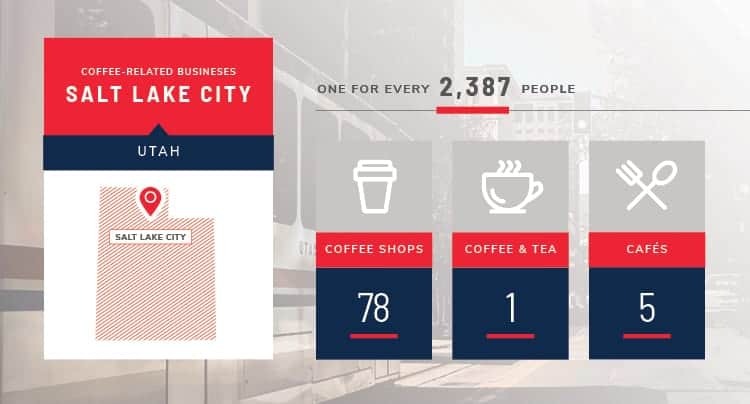 From single-origin espresso to green bean brew, pioneers like the Salt Lake Roasting Company and Millcreek Coffee have been paving the way for creative coffee purveyors for decades. Located 25 miles north of Seattle on the Puget Sound, Everett is the first of four Pacific Northwest cities on our top 10. The military town is home to Naval Station Everett, and a slew of local roasters keep around 6,000 sailors and civil servants assigned to the base alert at all hours. Coffee may not be the first thing that comes to mind when you think of Steel City, but the caffeine scene is growing fast in this proud Pennsylvania town. From cappuccinos at the buzzing Espresso A Mano to curry ginger lattes at eclectic Biddle's Escape, Yinzers have a wide variety of coffee shops from which to get their daily jolt. With an average snowfall clocking in around 60 to 70 inches annually, the country's coldest urban center tends to Jones for java. Locals escape sub-zero temperatures and blizzards (in April!) with cozy caffeinated beverages in warm independent coffee shops and the beloved local chain, Caribou Coffee – founded in nearby Edina. 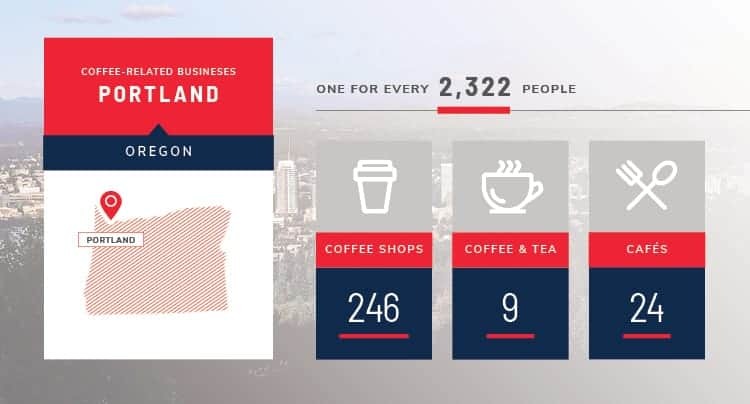 Home of Stumptown Coffee Roasters, Portland's coffee culture is strong – arguably the strongest in the country. The city trumped coffee rival Seattle multiple years to take Travel + Leisure's title of America's. Alas, judging by the number of coffee outposts per capita, Seattle edges out Portland by a hair on our poll. Starbucks was born here in Pike Place Market back in 1971, opening the door for a flood of Seattle roasters to follow, from Tully's Coffee to Caffe Vita Coffee Roasting Company and many, many more. Whether they're searching for Bulletproof Coffee or the perfect pourover, Seattleites have a diverse array of excellent coffee shops to choose from. Perhaps you've heard about the “third wave of coffee"? 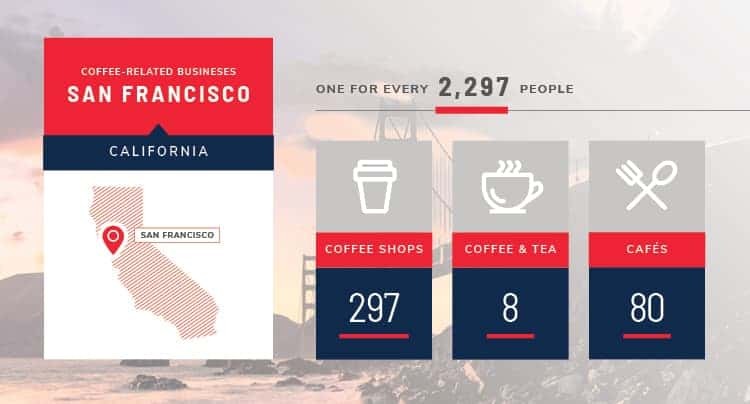 Powered by high-quality artisanal coffee, the latest trend started with roasters like Blue Bottle, which only sells beans that have been roasted within the last 48 hours. Locals also swear by third-wave pioneers like Ritual Roasters, Sightglass Coffee and Four Barrel Coffee. Located just across the Columbia River from Oregon, Portland's largest suburb is equally devoted to coffee culture. In fact, Vancouver edges out its sister city on our top 10 thanks to a slew of places to sip, from Relevant Coffee to Compass Coffee. Many brew aficionados trace coffee's third-wave back to Peet's Coffee, which started selling hand-roasted small batch beans in 1966 near the University of California. Today, Berkeley takes the title of the best city in the U.S. for coffee lovers, with more coffee shops per capita than any other city in the country. Are you looking for an even better-tasting cup of coffee? Then maybe it’s time to invest in a new coffee grinder. But with all the options on the market, it can be hard to choose the best machine for you. As news of the potential demise of wild coffee due to climate change spread far and wide last month, one smaller subject was somewhat overlooked. In fact, it’s been largely overlooked for hundreds of years. Coffee may the key to a raise. So implies a recent study of stimuli and perception.